A new base has been opened by the Nigerian Army in Katsina, naming it after President Muhammadu Buhari. The Nigerian Army has opened a new base named after President Muhammadu Buhari at his hometown, Daura, in Katsina State, Premium Times, reports. The new unit is named “Fort Muhammadu Buhari Forward Operation Base”, the army said in a statement Friday. It said the unit was set up “to further enhance security in parts of 1 Division Nigerian Army’s area of responsibility”. 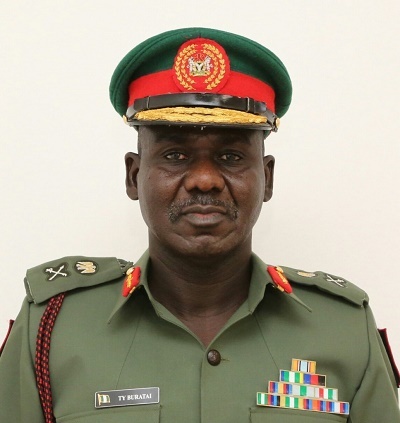 “The establishment of the new unit was part of the implementation of the the Nigerian Army approved Order of Battle 2016 (ORBAT 2016) by the Army Council,” the statement by Sani Usman, army Brigadier General and spokesman, said. Separately, senior army commanders on Thursday met in Jalingo, Tabara State, with the state governor, Darius Ishaku, to review the security situation of the state. The team was led by the General Officer Commanding (GOC) 82 Division Nigerian Army, Adamu Abubakar, a major general. The delegation had the commander 13 Brigade, Bulama Biu, Brigadier General, the Commander 82 Division Provost Group, Ahmadu Abubakar, Colonel, the Commanding Officer 93 Battalion Ibrahim Gambari, a Lieutenant Colonel; and the Commanding Officer 20 Battalion, Awwal Abdullahi, Lieutenant Colonel.